There have been a few standout instances in the history of film...in which the fresh vision of an up and coming director - and the hard fought talents of a veteran actor - have merged organically to deliver an outstanding overall picture. Example? Novice Steven Spielberg directed legend Joan Crawford with great aplomb in the 1969 Night Gallery television pilot. And such was the case when Peter Bogdanovich helmed fright king Boris Karloff in Targets, one of the most controversial films of 1968. Bogdanovich (also appearing in the Targets cast) had been an assistant to producer Roger Corman on a film called Wild Angels. Corman was so impressed with his work, he approached him soon after with a proposition. Karloff owed Corman two days of work. If Bogdanovich could shoot 20 minutes of film with him in that time, assemble footage with another group of actors...and then cross-cut the two stories, Corman would finance the project. In addition, scenes from The Terror (Corman's 1963 chiller quickie co-starring a young Jack Nicholson) were to be used. The non-Karloff storyline would be based on the case of Charles Whitman, a young man who killed his wife and mother in 1966...and then climbed to the top of the University of Texas Tower and shot people at random, killing sixteen and wounding thirty. After a screening of his latest horror picture, The Terror (set to open the next day), Byron Orlok (Boris Karloff) announces to his stunned associates that he is retiring. Among those in the auditorium are the film's director, Sammy Michaels (Bogdanovich) and Byron's secretary Jenny (Nancy Hsueh). Both are sympathetic to the aging actor, having known of his wish to move back to England. Producer Marshall Smith (Monty Landis) is furious and tells Byron, "if it weren't for me, the only place you'd be playing is the wax museum!" Byron simply walks quietly out of the room to his car. Marshall sends Sammy out to speak with him, since the director has a vested interest...having written the script for the next project he is to helm with Byron. But Byron has made up his mind. "I'm an antique," Byron says, adding (in our favorite line, delivered with just the right dash of sarcastic resignation), "the world belongs to the young. Make room for them...let them have it." Across the street, someone watches from a fire arms shop. Sweet and innocent-looking Bobby Thompson (Tim O'Kelly) aims a shotgun at Byron before purchasing it. He puts the rifle in the trunk of his car (which happens to be filled with a cache of weapons) and heads towards his home for dinner with his clean cut family. On his way, he passes by a drive-in that is set to begin showing Byron's movie. To celebrate his "freedom," Byron and Jenny go out for drinks, where they're joined by Ed Loughlin (Arthur Peterson) who reminds Byron of his obligation for a personal appearance at the drive-in for the premiere of The Terror. But Byron says he will not attend, much to Ed's consternation. Bobby leads an average middle American life with his wife, Ilene (Tanya Morgan), and the couple live in the same house with Bobby's mom and dad (Mary Jackson and James Brown). They watch television together like many families do - and Bobby likes to go target shooting with his father, an avid gun enthusiast. Sammy swings by Byron's hotel room to pick up his script, which the actor hasn't even bothered to read. Instead, Byron has been enjoying one of his old films on the TV. Sammy still feels that Byron should make his movie, which contains a more dramatic part...but Byron says that people think of him as "high camp" and "old-fashioned and outmoded." In a poignant scene, Byron reminds the young director of what his role was in the industry of days gone by. "Mr. Boogeyman, King of Blood - they used to call me. Marx Brothers make you laugh. Garbo makes you weep. Orlok makes you scream." He adds, "no one's afraid of a painted monster" anymore and to prove his point, he shows Sammy a newspaper headline about a youth who killed six people in a supermarket. The two men get drunk and pass out on the bed. Back at the Thompson house, things are about to turn tragic. Ilene returns home from a late shift at work and finds Bobby sitting in bed and smoking in the dark. The next morning, Bobby puts his dark plan into motion as he methodically shoots and kills his wife and mother...and a delivery boy (Warren White) who has the unfortunate timing of dropping off groceries at that moment. IT IS NOW 11:40 A.M. MY WIFE IS STILL ASLEEP, BUT WHEN SHE WAKES UP I AM GOING TO KILL HER. THEN I AM GOING TO KILL MY MOTHER. I KNOW THEY WILL GET ME, BUT THERE WILL BE MORE KILLING BEFORE I DIE. At the hotel, Jenny finds Byron and Sammy hung over, but she's relieved to hear that her boss has changed his mind and will attend the drive-in premiere after all. During a run-through with Kip Larkin (Sandy Baron), a DJ who is set to interview Byron, the actor instead decides to rehearse a scary story he would prefer to tell the audience for his final public appearance (providing for a classic Karloff moment). Bobby purchases more ammunition and from atop a power plant overlooking the freeway, he fires off several rounds...wounding or killing several drivers and passengers. In addition, he kills a worker who stumbles upon him. The violence gets the attention of a police officer and a chase ensues. But Bobby manages to escape and he heads into the drive-in to wait for that evening's ceremony. As night falls, the crowd begins to build. Bobby settles in behind the movie screen, with a small hole enabling him to get a good aim. Byron and Jenny arrive and their car is parked near the front of the audience. Bobby begins shooting people at random, including the projectionist. Soon, pandemonium breaks out when a man yells, "somebody's shooting! A sniper!" Byron is still not sure what is going on but finds out when Jenny is shot in the back. Looking over towards the side of the screen, he sees Bobby trying to flee and starts walking towards him. With the image of the actor on the screen next to him and Byron coming from the other direction, Bobby seems disoriented by the fusion of fact and fiction. As Bobby is taken away, he shows no remorse and brags to the cops that he"hardly ever missed." Targets gave Bogdanovich the opportunity to work with his wife Polly Platt, who provided the costume and production designs. Together, the couple also came up with the story concept but it was director Samuel Fuller who gave excellent script advice and the suggestion that Bogdanovich shoot on the cheap...and save his budget for a big finale. When the movie finally opened in the summer of 1968, it suffered at the box-office because of events that simply could not be foreseen by the filmmakers: the assassinations of both Martin Luther King, Jr. and Bobby Kennedy. Despite good reviews, audiences were in no mood to see a movie about a sniper. At times feeling a bit like a student film (albeit a very polished one), Targets should not be overlooked. The theme is timely. In a post-September 11th world in which videotaped beheadings of the innocent are commonplace, can ANY horror film be truly effective or have the impact the genre had in the past? Out of the cacophonous sixties, Targets can be seen for what it is: a terrific character study of two men. One, an innocent boy-next-door who becomes a killing machine. The other, an old man who doesn't believe there is a place for him in modern society. The latter performance by Karloff beautifully conveys the shift from old school to the new horror that was taking place at the time. The final moment in which the man who made a living by playing monsters meets his real-life counterpart is well worth the wait. Additionally, Karloff's presence serves to remind us (gently, but constantly) of the four decades of horror that came before. 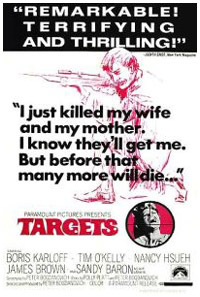 A quiet (and knowledgeable) respect for the cinematic past undulates throughout Targets...an awareness all but dead today and replaced by viewer ignorance, floundering gimmickry and originality at best parasitic. Tim O'Kelly is excellent as Bobby. His transformation into a cold-blooded murderer is both believable and horrifying. When he tells a clerk at a gun shop that he is going to "shoot some pigs," it sends chills up your spine. In fact, those are the precise words that Charles Whitman spoke before his killing spree. Karloff would appear in several more films including House of Evil and Curse of the Crimson Altar - before his death in February of 1969. However, he was proud of Targets and considered it his true final picture. Major success would come to Bogdanovich in the first half of the next decade with 1971's The Last Picture Show (for which he received an Oscar nomination), the madcap Streisand gem What's Up Doc? (1972) and 1973's quirky but effective Paper Moon.